In storm-ravaged Panama City, a new crisis is emerging: Housing. Across the city, evictions are taking place as apartment complexes and rental units are condemned. Many of these are rent-controlled and income-based, and that’s leaving hundreds of people scrambling for places to go. For some, there’s nowhere to go. 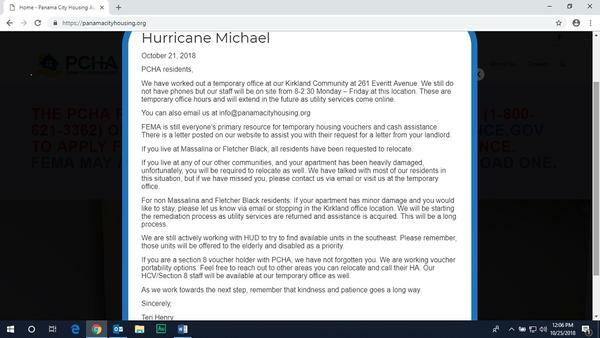 The Panama City Housing Authority’s website has a sign up on its home page. The Housing Authority says half of its 600 units have been damaged by the storm. Its phones are down, and its directing residents to reach out to FEMA. It’s also told people they have only days to leave. The Housing Authority serves poor residents. Many of whom cannot afford to just pack up and go. Hurricane Michael destroyed the Macedonia Gardens apartment that Graham, her two young children and elderly parents lived in. While Macedonia Gardens isn’t under the oversight of the Panama City Housing authority, but it is considered affordable housing and subsidized by the federal government. Graham got a letter telling her she had 72 hours to leave. It was taped to doors in the middle of the night shortly after the storm. Graham is presently living in her father’s truck with her two young children and her parents. She can’t get to a shelter because her checking account is overdrawn, there’s no money for gas, and the vehicle has a broken axle. Recently, the mayor of Panama City weighed in on the issue via a conference call. Legal Services of North Florida's Litigation Director Scott Manion was listening in. “Basically, he said he told the sheriff not to move anyone out of their apartments. There’s a crisis over there. The whole city. There’s 10,000 people without a place to live. All the daycare centers are destroyed. All the nursing homes are destroyed. They can’t find any of the teachers. They can’t get the schools open. It’s a crisis," Manion says. The lack of housing only adds to it. Damage to several low-income housing complexes means some are in the process of being condemned, but Manion says even under that circumstance, tenants still have rights. Tanja Graham’s apartment complex referred her to one in New Orleans as a possible housing option. But when she called, she says the manager there had no idea what she was talking about, which raises another issue--when government-subsidized housing becomes unlivable, owners and landlords are obligated to help their tenants relocate. “There’s processes in place that streamline the ability for owners to place their tenants in other similar available units throughout the community," says Brenda Ezell, Chair of the Real Estate Leasing Committee of the Florida Bar's Real Property and Probate section. Federal law makes provisions on what to do when properties have been condemned, which is happening now in Panama City. But she says those three-day notices telling people to leave, are likely illegal. 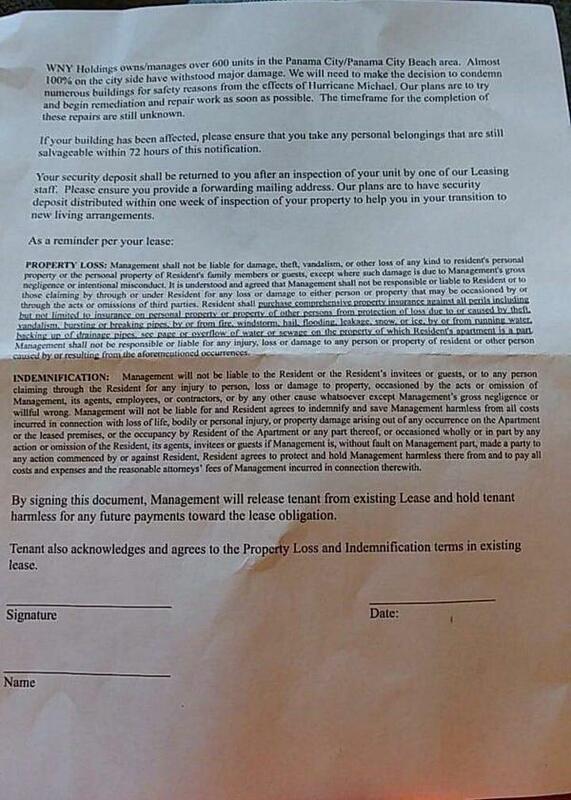 Even if a property has been condemned, a formal eviction notice still has to be issued. “They have to go through the Florida eviction process. they can’t just tell you to go. If you go voluntarily, that’s one thing but they would have to go through the legal, process for eviction, the state process—the statutory process," Ezell says. Both Manion and Ezell say the best thing for these residents is to stay put and contact the Federal Emergency Management Agency, FEMA. It can provide both temporary housing for hotels, and longer-term rental assistance. But it’s one or the other, not both, says FEMA spokeswoman Nikki Gaskins. The temporary shelter assistance is good for up to 14 days. Yet the list of participating hotels on FEMA’s website doesn’t show any in the immediate Panama City area. And there are only about 20 in the panhandle. Hotel participation in the program is voluntary and Gaskins says people may have to travel to find a place. The same is true for those who get the longer-term rental assistance. That rental assistance is what Tanja Graham is waiting on. She says she was told her check was mailed October 23rd and she hopes it gets to her soon. The Panama City Housing Authority says half of its 450 apartments will likely be condemned. The letter Tanja Graham received from her landlord says of the 600 properties the company owns in the area, almost all on the city side will have to be condemned.